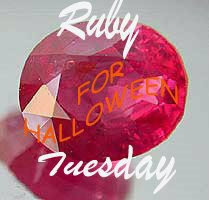 If you're celebrating Halloween I've suggested we post Halloween decorations, with some RED in them, for Ruby Tuesday. If you don't celebrate Halloween in your country, how about posting some Fall foliage or anything you want (with some RED) for our enjoyment! Would you take a moment from our Ruby Tuesday meme? I participate in a couple of Black & white memes and I love them but I miss that SEPIA look. That warm brown color that suggests way-back-when but can also have a very modern feel. And it's NOT hard to create sepia photos from your regular color or black & white photos! I'll show you how! Click on this link and I'll tell you all about our new meme and how to participate! And now back to Ruby Tuesday! Here are some of the decorations around my neighborhood! 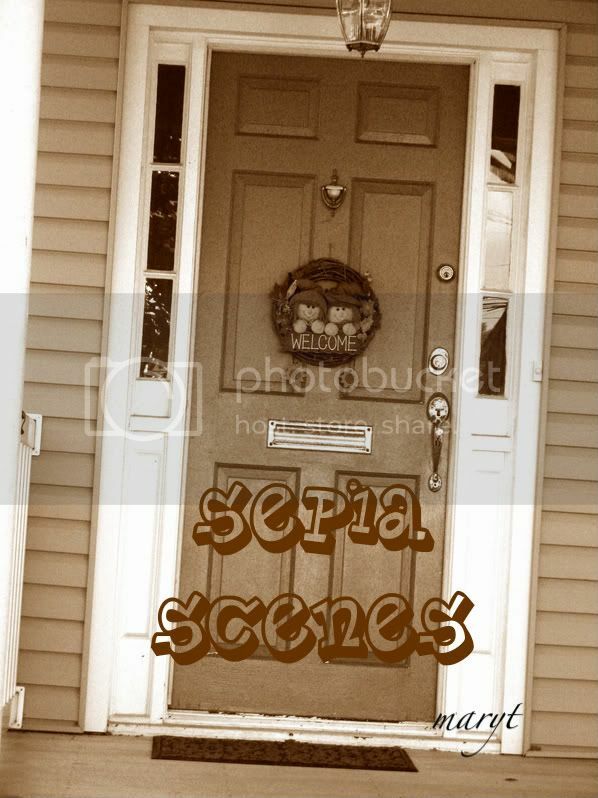 The photo in my header is a decoration from the house across the street! Don't forget to visit your fellow Ruby Tuesday posters. 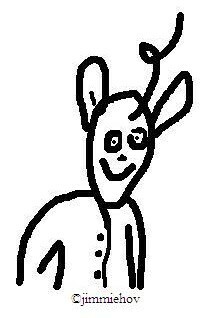 Oh and also don't forget to sign Mr. Linky and make a comment if you can. I can but laugh of your way of exaggerating. It's fun. Too much of a good thing is...wonderful. Well I found a few Halloween Yard Kitsch with red! You found some goodies! 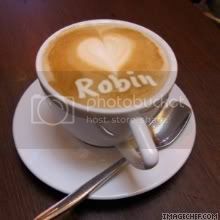 Enjoy your week.. Interesting to see the decorations you spotted, here Halloween is something "new". The sepia meme is a good idea, I'll certainly think about it when I have a 'just perfect for sepia' shot. I'm on the road for a few days with very limited access, but I'll get around to everybody I can either while I'm gone or when I get back. Bloody reds! That would surely be dominant for the theme! Have a nice week! What great seasonal scenes. I am very impressed with great talent of Elaine of Napaboaniya. You have a nice helper. I am not sure if I can do the Sepia thing. I have restored hundreds of historical photos and they look good in sepia, not sure my photos would. 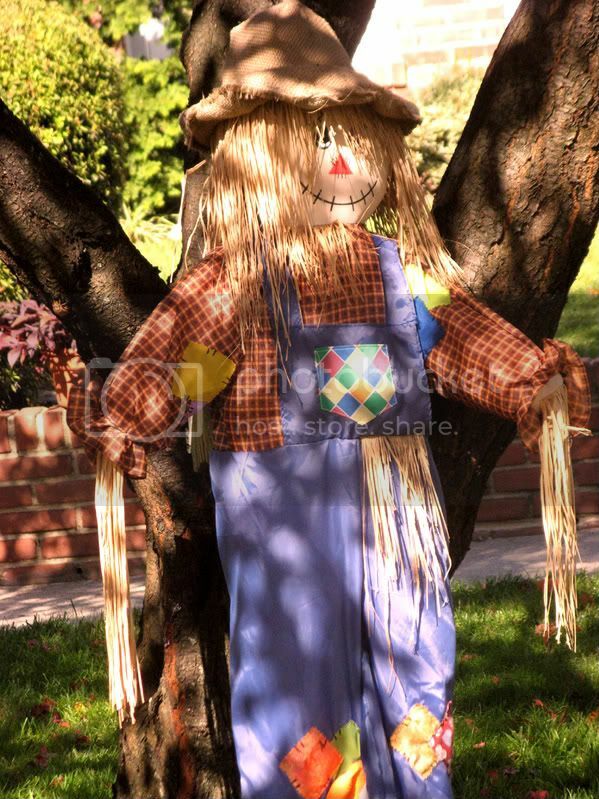 My favorite photo was the first scare crow. Great pictures Mary and I loved the angles - especially the last one! I'm checking out the new meme. You'll notice today I did a double post with another new meme as well. I just love those Halloween decorations!! I am stoked over Sepia Scenes. I love working with Sepia. What day of the week will it be held on??? Patti has more of the Halloween, but I offer foliage and kids. What else would you expect from me?! And that sepia-meme sounds fun, I love sepia photos and experiment with it when I have the opportunity and the object fits. Those photos have a very appealing and certain wistful sentiment. too early for my time zone this week! :) see yah around! oh i like the guy with the tray at the door. he's welcome to my house any day. Nice, I don't have decorations this year, so foliage it is! Happy Ruby Tuesday! I like your photos, especially the creepy guy with the tray. Love your Halloween photos this week and am sorry I forgot all about doing this myself. I did however just publish my Ruby Tuesday post at Small Reflections. The Sepia meme sounds fun. I like the picture of the door. Great photos! Wonderful decorations. Fall is my favorite season. I'm not a huge fan of Halloween, but I do love Autumn. Have a wonderful Ruby Tuesday. Wow, your neighborhood goes all out for Halloween. It reminds me of when I lived in a suburb of San Francisco. Everybody hung ghost sheets from the trees and placed ghouls near the sidewalk to scare the trick-or-treaters on Halloween night. Where I live now is a rural subdivision. The houses are far apart and the trick-or-treaters don't make the rounds. I miss them. Your neighborhood is cool. Very nifty decorations. Great job finding red! All my decorations are orange and black. Cool idea for a meme too. My plate is too full to join in right now, but hopefully I can in the future. 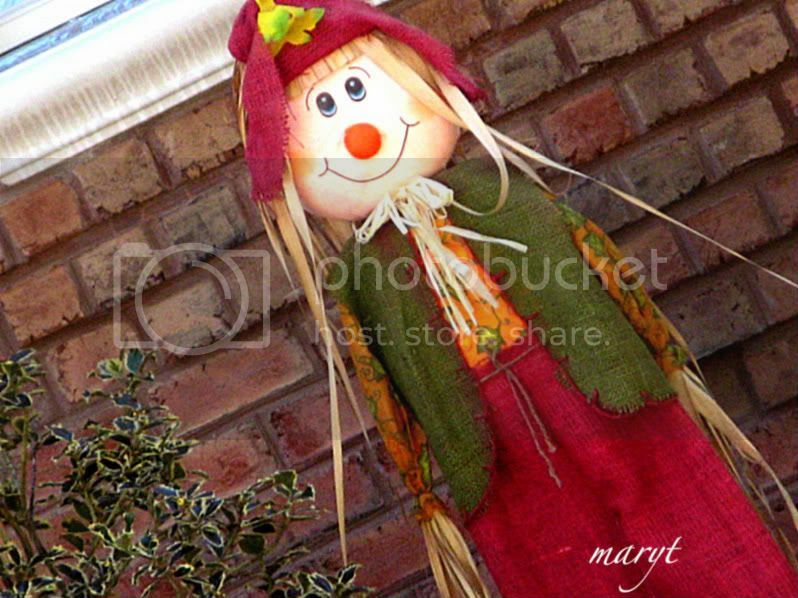 Love the scarecrow, Mary. Happy Ruby Tuesday. Your reds are great for Halloween. I love that 2nd one, and he is really scary! We don't celebrate Halloween in Singapore. So I have no decorations to show. Love your Halloween pictures. I'm afraid I don't have any Halloween pictures so I posted a couple of pictures of my favorite subjects--my grandkids. 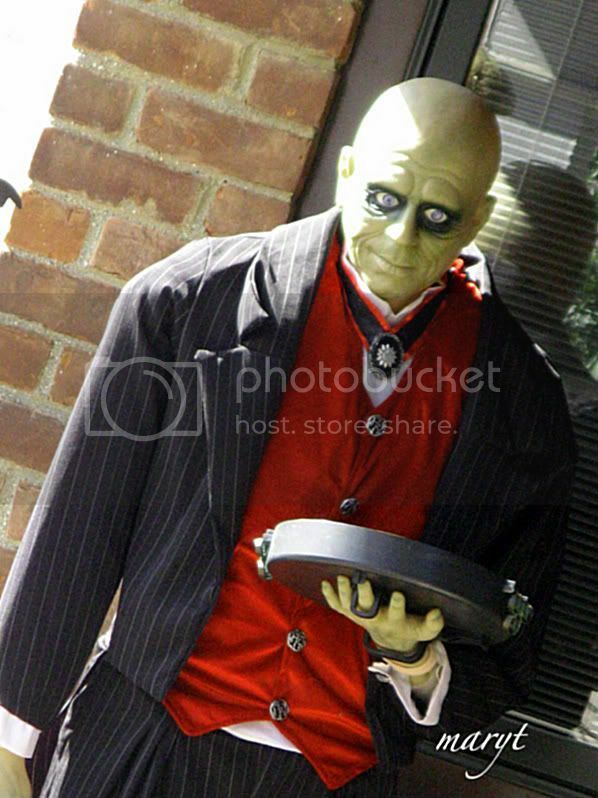 Great Halloween decorations, and I just love the quality of the color and light in your photos. Really excellent! Definitely foliage for me. Haven't dug out the Halloween decorations yet this year! I love Halloween! Your photos are fun. :D Do you dress up for the holiday? I didn't put up my decorations yet - the are painting the buildings here, but I'm going to go ahead and put them up tomorrow. I don't think they'll make it to my building in time. Halloween is a little celebrated in Belgium, I say little in comparision to the States ! I find it funny and therefore like it and have decorated my living room. I'm in Shreveport, Louisiana, today so went to the files again. There weren't any Halloween things were Mrs. Jim and I were a couple of years ago for this file photo. Hi Mary, these are great! You do things up in a big way. Five years ago we watched the Greenwich Village Halloween Parade, it was super! This is very early in the morning but I was determined not to miss out on posting another Ruby Tuesday. Ha!! Bernie is forever noticing red all the time too! I love it, I really do but blue is my very favourite color Miss Mary. It is very surprised that it is on the back burner for the time being that's all! Love your Halloween images, especially the jaunty first one! No Halloween or fall foliage here so I went with something completely different. Come see. Great ruby red finds for Halloween. Happy Ruby Tuesday! the 2nd photo was really scary, Teach Mary. My entry is up. Happy Tuesday! Just click on Sherrie's Stuff and you'll go right there. Take Care!! my first time joining!! this is such a great meme, nice pics, I love taking pics of neighbors spooky halloween designs, very nice!! I might join that sepia meme, too. have a blessed day!! Mary!! many of your Halloween friends look a lot like mine. which would make us in-laws at least - I'd like that!! Very nice decorations from your neighborhood. I didn't post Halloween decorations. I found a picture in my files that is red. mine isn't halloween! man! but it's also good for the holidays! I posted our party pictures. Your neighborhood looks like a fun place to live. I guess mine's a little too scary all year round for us to want to make it any scarier. I love the undead butler, Mary! I posted a scary tale and a "reddified" picture of me for your Halloween Ruby Tuesday today! Cool decorations.. make me wish Halloween was big in Sweden but unfortunately it's not! We have a bit of patriotism going on over at my blog today ... just feeling thankful for so many American freedoms. I should have visited here first to see you had a Halloween theme. I've got to thank you once more for your Ruby Tuesday and the topic of this week. Silly old me have learned a lot about American Hallows' Eve. Terry, Mrs. Mac and Dianne; all have done a thorough work in explaining the depths and also quality tradition of what in Norway only is a toy store thing. My impression is that Americans are very good at celebrating, gathering young and old and throwing a party. How very nice and sympathetic. I even went to Wikipedia and learned more.. That Halloween was fist known in Norway at the end of the 1990ies. I also remember that daughter Serina 2 times dressed as a witch and went to carnival around Halloween time. But we know nothing about decorating our homes or gathering family for celebration. From Felisol, still busy being born. Your blog this magnificent, with all these beautiful pictures that I love. Congratulations. Besides all the good things you can see, read and learn here. I love Halloween!!! It is so scary and fun. I'm one of the ones that doesn't do Halloween, so it's red folliage for my post this week. I posted- but not Halloween! I don't know what FIOS is, but it must be very important. Good luck with it! I love the halloween photos, especially the practically incandescent vest on the gentleman in the middle. Now THAT's red, although it's probably really orange. Looks great, though. Thanks for this great meme. So, it's Thursday, and I posted a picture with red for another theme...I'm doing Ruby Thursday this week. Maybe by next Tuesday I'll have a sepia idea. I'll enjoy looking at them (the sepia pics).